The decision to play (or not to play) certain songs on the radio can have financial ramifications for performers and for radio stations alike in the form of ratings and revenue. 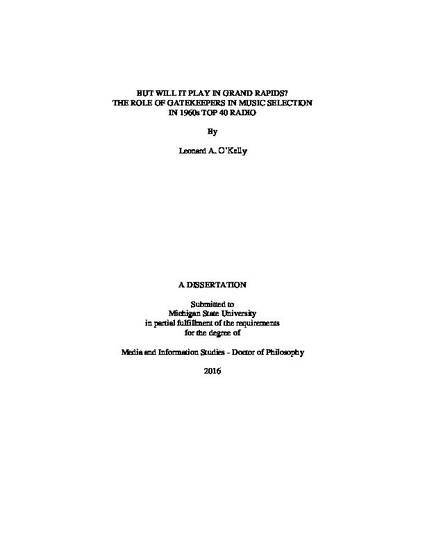 This study considers the theory of gatekeeping at the individual level, paired with industry factors such as advertising, music industry promotion, and payola to explain how radio stations determined which songs to play. An analysis of playlists from large-market Top 40 radio stations and small-market stations within the larger stations’ coverage areas from the 1960s will determine the direction of spread of song titles and the time frame for the spread of music, shedding light on how radio program directors (gatekeepers) may have been influenced in their decisions. By comparing this data with national charts, it may also be possible to determine whether or not local stations had any influence over the national trend. The role of industry trade publications such as Billboard and The Gavin Report are considered, and the rise of the broadcast consultant as a gatekeeper is explored. This study will also analyze the discrepancy in song selection with respect to race and gender as compared to national measures of popularity. Interviews with disc jockeys, program directors, and music directors seek to determine exactly what role the individual air personalities had in determining the songs that were played and, as such, what role these specific gatekeepers had in shaping the popular culture of a decade.